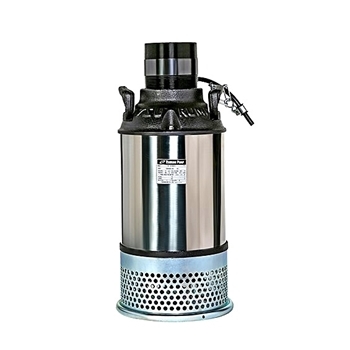 Tsurumi 4HF High Flow Water Feature Pump features a 304 Stainless Steel housing, oil-free motor, and an axial flow impeller for incredible flows at low head heights and low energy consumption, while passing a 0.3" solid. Its larger size and incredibly high flow may require more space and flow than a skimmer can provide, so be sure to check fit. The cast iron axial-flow impeller achieves huge flow rates with low energy consumption. Dual inside mechanical seal with silicone carbide faces provide long life and an oil lifter provides lubrication of the seal faces.